After 43 years and hundreds of millions of visitors, the country’s most popular museum is getting some much-needed TLC. Here’s what to expect from the National Air and Space Museum’s nearly $1 billion renovation. See photos. Since 1976, hundreds of millions of visitors have walked through the halls of the Smithsonian National Air and Space Museum to marvel at the tools and technologies that swept Americans off their feet. And for the next seven years, aviation enthusiasts might notice some new machinery inside the country’s most visited museum — namely, cranes, lifts and other construction vehicles. The Air and Space Museum is in the beginning phases of a seven-year, nearly $1 billion renovation project that will rebuild the museum in stages while it remains open to the public. Once complete, the museum will have a new facade (the building’s exterior stone panels are warped and worn), improved infrastructure, a modern look and updated galleries that tell a more comprehensive history of air and space travel. “I want to make sure that every kid who comes into this museum can see someone who looks like them, who helped drive this country forward in aviation and space exploration. So you’re going to see a lot more diversity in the stories that we tell,” said Ellen Stofan, director of the Smithsonian’s National Air and Space Museum. For the renovation, nearly every artifact in the museum will be packed up and moved out, with the exception of a few items, including the nose of a Boeing 747 and Charles Lindbergh’s Spirit of St. Louis, which will be protected in place. 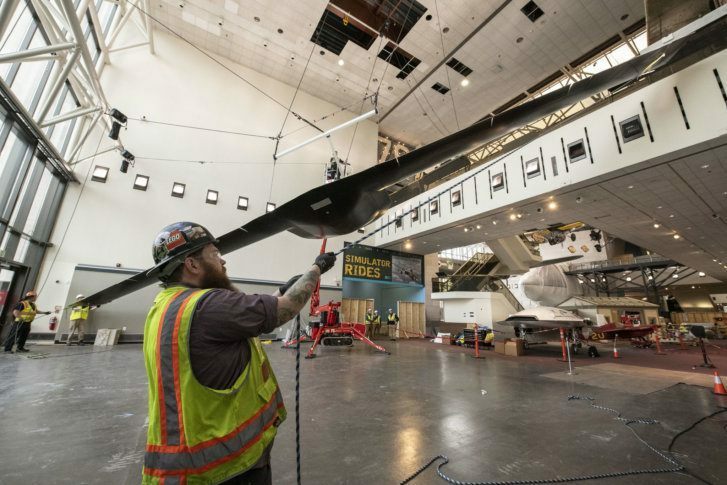 Most of the other aircraft and spacecraft will be lowered, dismantled, wrapped, and transported on a truck to a climate-controlled storage facility at the museum’s Steven F. Udvar-Hazy Center in Chantilly, Virginia. “All of this is done extremely carefully, extremely well documented,” said Stofan, a former NASA chief scientist who has been leading the museum for about a year. Giant F-1 engines that powered the Saturn V rocket to the moon also need to relocate from one side of the museum to the other — “and they are extremely heavy,” Stofan added. Currently, the museum’s west wing is closed, and after a few years, work will move to the east side of the building. But Stofan said just because a few galleries are temporarily unavailable, doesn’t mean locals and tourists should cancel their plans to visit. The Air and Space Museum has a number of special exhibits open and events planned throughout the year — especially in the summer to celebrate the 50th anniversary of Apollo’s moon landing. And while seven years may seem like a long time for a building renovation, Stofan said it will all be worth it in the end — and for decades to come. “We’re going to be telling the story of: Where are we going in space flight? Are we going back to the moon, going on to Mars? How is aviation changing? Are we really going to go to flying cars?” Stofan said. The first set of renovated galleries at the Air and Space Museum is scheduled to open in 2022.